Part 3 is an activity building the physical circuit. Clean up all parts in the series with final editing. Digital Pins: How the pins work and what it means for them to be configured as inputs or outputs. Analog Input Pins: Details about the analog-to-digital conversion and other uses of the pins. PWM: How the analogWrite() function simulates an analog output using pulse-width modulation. Some interesting ideas emerged. First, I learned a few ways that it's possible to break an arduino, and probably the riffle too -- by short circuiting connections from the pins to the ground -- making a circuit that doesn't have enough resistors/resistance, which allows too much current to go through. I read an entertaining article about more ways that electronics can break an arduino, and now feel sufficiently warned to treat all these electronics with careful planning. Second, I'm not sure about the 3V3 and GND pins. Do they differ in hardware from the other digital pins, to be better at supplying voltage and ground to the circuit? Can they support higher current draw? What is the story with these pins? From what I can make of this, I'm guessing that not every numbered pin is exposed on the pin out. 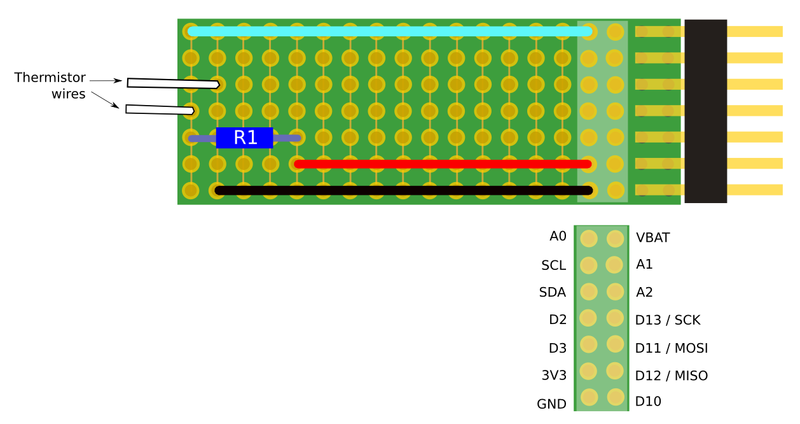 Pin #5 is the RTC interrupt pin, #6 powers the SD card, #9 controls the onboard LED. I think that #3 is a pin leading to the battery, and #4 is the VBAT pin on the pinout that reads what the battery voltage is -- but I'm in way over my head here. (I will update this text once I know what they mean for sure). The analog pin being used is named A0. It looks like #8 might correspond to the 3V3 labeled pinout, if that's what header power refers to. And the pinMode() and digitalWrite() commands are being used to supply voltage to the sensor or not using the 3V3 pin. It seems that now I have enough information to be dangerous with the riffle hardware. Is it possible for research notes to do code highlighting the way it looks in github? Can I modify an existing sketch and make a breadboard circuit that blinks an LED? Tune in next week for Part 3 to find out. Literally -- I'm going to be on a camping trip until Sept 27th! Eventually I'd like to work on the conductivity circuits that others have been working on!